If NC State ace Carlos Rodon was eligible for the draft this year, we would more than likely be looking at a three-way battle for first-overall pick along with Oklahoma’s Jonathan Gray and Stanford’s Mark Appel. 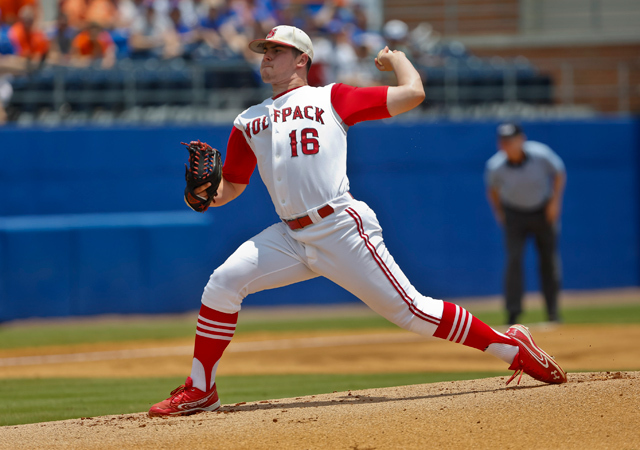 In his first two seasons for NC State, Rodon has been one of, if not the best starting pitcher in college baseball and he certainly displayed that on Saturday in NC State’s 1-0 victory over William & Mary. Rodon went the distance, pitching a complete-game shutout against the Tribe in dominant fashion. Rodon brought a no-hitter into the sixth inning before Willie Shaw broke up the no-hit bid with a two-out single to right field. The Wolfpack flamethrower would only surrender one more hit on the night, finishing the effort with ten strikeouts and walking no batters. Rodon capped off the game by striking out the side in the ninth inning. He has now registered eight or more stikeouts in all but one of his 16 starts this season and has tallied double-digit strikeout totals in three consectutive starts (Rodon has registered double-digit strikeouts in seven starts this season). His Saturday outing was a representation of his masterful pitching this spring, a season that has seen him post a 9-2 record and 3.19 ERA with a superb 161/40 strikeout to walk ratio in 110.0 innings of work. As a true freshman last season, Rodon put up just as dominant numbers, posting a 9-0 record and 1.57 ERA to along with a 135/41 strikeout to walk ratio in 114.2 innings. How much does Rodon mean to this Wolfpack club, who have won a single-season club record 46 wins this season behind the leadership of their star ace? NC State coach Elliott Avent sums it up best. A 16th-round draft pick by the Milwaukee Brewers in 2011 out of high school, Rodon elected to forgo professional baseball and attend NC State. Two years later, that decision appears to have paid off excellently for Rodon and the NC State ball club. Coming out of high school, Rodon possessed a solid pitch arsenal and was noticeably smaller in terms of stature. Rodon has added 30 pounds to his now muscular frame, which has allowed him to add velocity to his fastball and maintain that velocity deep into starts. His diverse pitch arsenal is highlighted by a blazing four-seam fastball that averages in the mid-90s (which can touch between 97-98 MPH at times) and explodes in the strike zone with superb movement. A cutter accompanies his four-seamer quite well, commanding the pitch in the low-90s with hard action and baffling command. His curveball has developed into a plus pitch and solid off-speed offering and his splitter continues to develop into another plus pitch. An arsenal as diverse and refined as Rodon’s is a rare occurrence and should place him far and above most pitching prospects on big league draft boards come next year. NC State has won its first two games of regional play in easy fashion, beating Binghampton 4-1 on Friday and William & Mary 1-0 on Saturday. After a regional tournament that saw the Wolfpack scramble to win three games in two days last spring, they will be able to sit back and observe on Sunday as Mississippi and William & Mary battle to stay alive in the NCAA Tournament (the winner of that game will face NC State later in the day). With a victory on Sunday evening, NC State will advance to Super Regional play, as Wolfpack ace Carlos Rodon will continue to carry the torch for a determined and hungry ball club in their quest towards grabbing the championship in Omaha.